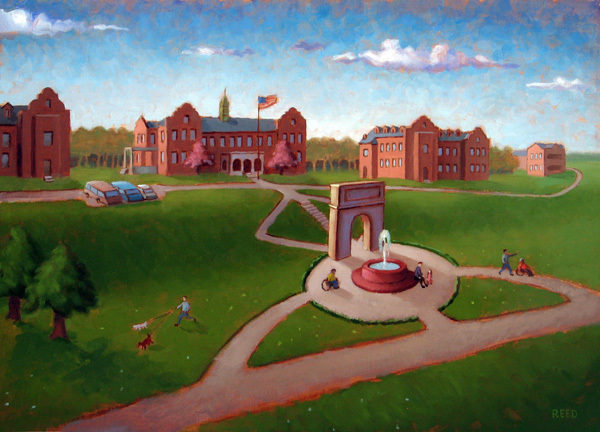 Above: an artist's depiction of the restored Pennhurst campus - complete with a monument to the triumph of disabled persons at Pennhurst. Incorporating an archive, library, conference facility, as well as a museum and memorial, Pennhurst could be a base from which the disability rights movement could build awareness, affiliation, and consensus within and outside the disability field—in short, a place where it could amplify the efforts it has and will take in fulfillment of its stated mission. Such facilities at Pennhurst will literally and figuratively give a monumental footprint to the advocacy movement's past and future. Though interpretation of the plight of persons with disabilities, an interpretive center will remember past struggles for justice and address their contemporary legacies. Through a research and conference facility, an International Center for Conscience at Pennhurst will engage ordinary citizens in an ongoing national dialogue on social issues to build lasting cultures of human rights. Unlike the typical museum, it will not be place of passive learning but a place of active citizen engagement. It's mission will be one of truth seeking, of building a culture of "never again," of reconciliation, and of outreach though opportunities for public involvement, curriculum development and the like. This dialogue must be both about the meaning of the past and the shape of the future— with the full temporal spectrum of past, present, and future palpable in the Pennhurst visitor experience. What does it mean to be classed as the other and how and where is it still happening today? No other museum attacks this concern head on---a dangerous absence of dialogue where indifference is our enemy. Pennhurst as a center of conscience must address and engage conflicting perspectives. Individuals with disabilities and especially individuals with cognitive disabilities were the last group of people to enjoy the freedoms that are birthright of all Americans. However, the legacy of the struggle for rights for persons with disabilities is not static; it changes daily. We're now long past the legal and political struggle that closed Pennhurst. So that that achievement does not lose it's power or relevance, there MUST now and in perpetuity be a space for remembrance, reconciliation, and ongoing dialogue. Our goal is not to fossilize or glamorize the past, but to use it create a broader public consciousness. Questions to be asked: how did the bad things that happened at Pennhurst occur—in our own backyard? Where are the people that might have been sent to Pennhurst today? In what ways has society's understanding broadened and in what ways is there still much to do? Without the memory inscribed upon the landscape at Pennhurst, the vocabulary used to describe the the disability rights struggle loses its power. As the vision of that great torch of conscience lit at Pennhurst dims, so too will the public's understanding of just how dark the darkness has been. As memory dims, so too does that inner light of conscience that keeps policymakers from slashing budgets and activists and advocates at work.